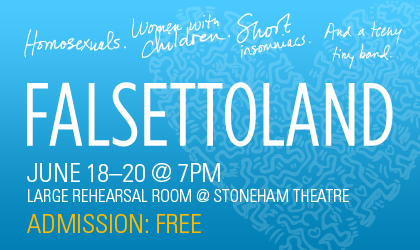 The Young Company at Stoneham Theatre’s production of Falsettoland this weekend is at once both the performance of a story about a complicated family in the ’80s, dealing with coming-of-age rituals and the as-of-then-unnamed AIDS epidemic, and also a powerful testament to new possibilities in our communities. William Finn’s musical is well executed by the teen ensemble cast. The show has very little spoken dialogue, and the eight cast members successfully carry the plot and the music, with a single piano for accompaniment. The show tells the story of a family in Manhattan, in the months leading up to the Bar Mitzvah of the only child, Jason (played by Daniel Begin). Jason’s parents are recently divorced and both in new relationships; his father (played by David Travis) with a man – the endearing Whizzer, portrayed by an oustanding Angelo McDonough – and his mother (Samantha Cunha) with his father’s [former] psychiatrist (Tyler Rosati). Amid fighting over caterers and guest lists, we learn, first, of the mysterious virus affecting “bachelors” that no one is paying attention to, and later, of Whizzer’s inexplicable hospitalization. The plot is both humorous and touching, with a fair share of self-effacing Jewish-themed jokes about schmaltz and perceived athletic ability (or lack thereof), as well as a moving response to the heartbreaking injustice of the AIDS epidemic. Even more powerful than the lyrics or Samantha Cunha’s vocals, were the real people in the theater tonight. That a cast of teenagers would take on a show with this kind of weight is awesome, but not entirely surprising — as a former theater kid, I know how we gravitate toward the hard-hitting drama — what was more noteworthy was the audience. At least 80% of the packed house appeared to be under the age of 18. The audience was filled with high school students, who clapped and whooped and (maybe) shed a tear for a story about a gay man battling AIDS. There is no hint of homophobic fear or bigotry in the main characters; even Trina, mom, dislikes Whizzer because he is her ex-husband’s lover, not because he is his gay lover. As a queer professional, I feel incredibly lucky that I occasionaly get to spend time with LGBT and queer young people. Being a teenager is tough enough as it is, but faced with rampant homophobia, transphobia, and gender policing in high schools, well let’s just say, queer kids are my heroes. I don’t know if any of the cast is gay, lesbian, bi, transgender, or queer — but I know that every person in that theater tonight came face to face with a nuanced portrayal of gay people, in which their sexuality was neither erased nor a hyper-visible caricature. That Whizzer and Marvin are gay is an important piece of the story, because it is part of who they are, but it doesn’t define them or their relationships with other characters. Jason, at twelve, never says a word about his father’s choice in partner, or his sexuality, but he clearly adores Whizzer, and approaches his illness with sadness, compassion, and empathy. I don’t know how many of the young people in that audience tonight use language like “gay,” “sissy,” or “homo” to deride and ridicule. I don’t know if any of them will think twice about using those words tomorrow. But I’m sure that every time they see LGBT and queer people portrayed with depth, compassion, and humanity, it sits somewhere in their mind, and helps us all move a little bit closer to the world as it should be. There are two more performances of Falsettoland this weekend: Saturday night and Sunday night. Click on the day for more information.